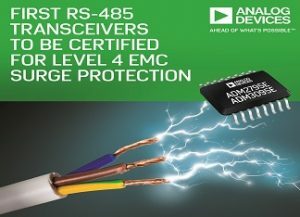 Analog Devices, Inc. on December 21, 2016, announced the industry’s first RS-485 transceivers fully certified for Level 4 EMC surge protection, thus eliminating the need for external transient-voltage surge-suppression devices. The galvanically isolated ADM2795E, using Analog Devices iCoupler magnetic-isolation technology, and non-isolated ADM3095E save space and component count, speed time to market, and greatly minimize regulatory compliance issues. The integrated fault protection offered by the devices prevents potentially destructive voltages from damaging the communication interface, which can result from failure s, surges, electrostatic discharge (ESD), and wiring errors. Designers using the new RS-485 transceivers no longer need to individually design, test, verify, and formally obtain regulatory certification of their implementation, as these components have the required approval. Also, no external protective components are needed, which eliminates the need to match these discrete devices to the specific RS-485 transceivers users have selected. This also yields a simplified BOM and smaller-board space footprint for a higher density of RS-485 ports. The ADM2795E and ADM3095E RS-485 transceivers meet IEC61000-4-5 Level 4 surge protection requirements, as well as industrial IEC immunity standards (radiated, conducted, and magnetic immunity) and EMC protection against ESD, electrical fast transient (EFT), and surge. Both devices are TIA/EIA RS-485/RS-422 compliant over their full supply range of 3 V to 5.5 V. In addition, the available evaluation boards, IBIS models, safety and regulatory compliance certificates, and videos and application notes available for the RS-485 transceivers greatly simplify the design-in process.